It's an absolute shame that this is the only Fudge Tunnel disc in my collection right now. The fact that I don't own Hate Songs in E Minor on CD is something I'm not proud of. That will be fixed at some point. In my impressionable youth (and I've mentioned this before, I believe), Spin Magazine was my bible. As often as I could, I'd pick up cassettes by bands who had received favorable mentions or reviews in the pages of Spin. This worked out well for me sometimes (I actually discovered Fugazi this way), not so well in other instances (why did I think I would like Scatterbrain?). In a 1991 issue of the mag, they mentioned Fudge Tunnel almost in passing, in a small sidebar that, if I recall correctly, summarized recent notable metal-ish releases. I'm not going to lie: the name intrigued me. Part of me wanted to say that I liked a band called Fudge Tunnel. I also wanted to hear what an album called Hate Songs in E Minor sounded like. I found the tape at the local record shop, and picked it up. It certainly wasn't anything like the music I was listening to at the time. It was sludgy, the screaming vocals were way down in the mix, and above all, it was heavy. And not like Heavy Metal heavy. Like a cinder block resting on your head heavy. I quickly embraced it, and when I found a Hate Songs poster at the same record store in the "free" bin, I made room for it on my wall. My mom was not stoked on it, but she let it ride. I had their Teeth EP (which was released between Hate Songs and Creep Diets for a long time, too, but that must have made its way into my brother's hands. So, here I am, with only this one on my shelf. I haven't listened to it in forever, and as it's blaring through my headphones right now, I'm not sure why. This album is great. It seems a little less purposefully dense than Hate Songs, but it's only leaving the songs sounding more complex and just as good. The one tough thing about Fudge Tunnel is that it's virtually impossible to make out any of their lyrics. Track two on this one is called "Tipper Gore," but it's hard to make out much other than "Do what I say/ Not what I do." Whatever, it's still a great track. The title track here is almost seven minutes long, and features a rare guitar solo. Not bad. Well, time to put this in the iPod. I am shocked that you don't own "Hate Songs." That is embarrassing. 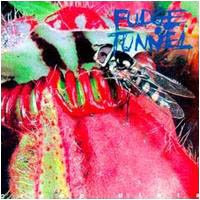 I am proud/ashamed to admit that I own the entire Fudge Tunnel discography. And yes I have your "Teeth." Although none of their other albums quite equal "Hate Songs" they are always enjoyable, save for "Complicated Futility," which finds the band going a bit serious and ends up being kind of boring. "Creep Diets," the album, is weird in that it is less heavy than all their other stuff. "Grey" is still pretty unbeatable. And "Don't Have Time For You" is almost a pop song. Bizarre.